Dr. Arti C. Amin is a board-certified Podiatrist who specializes in the conservative and surgical management of the foot and ankle, including wound management. 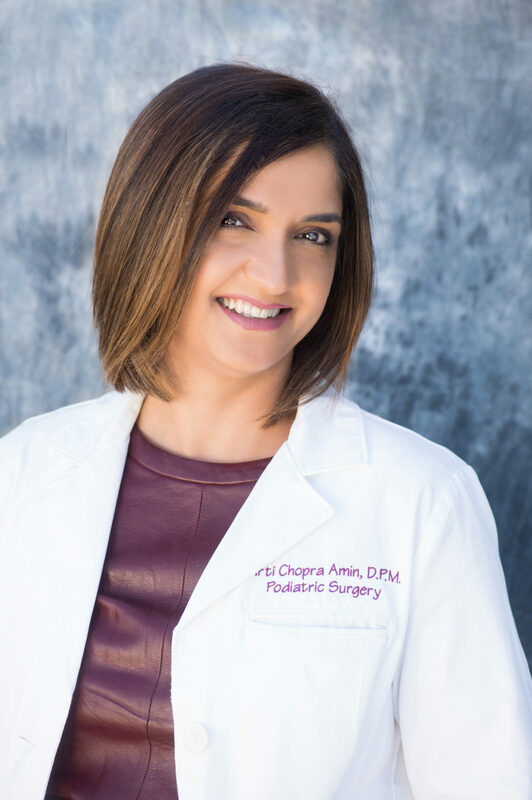 After earning a bachelor’s degree in Biology from UC Irvine, Dr. Amin earned her podiatric medical degree from the California College of Podiatric Medicine. She completed her surgical residency training at Bellwood General Hospital and Bellflower Medical Center in Bellflower, California. She is board certified by the Board of Multiple Specialties in Podiatry in the treatment and prevention of diabetic foot ulcers, Primary Podiatric Medicine, and Foot and Ankle Surgery. She is also an associate professor at Western University, Pomona. The conditions Dr. Amin most often treats include diabetic feet; arthritis; bunions; hammertoes; corns and callouses; skin and nail conditions; sports injuries; fractures; children’s feet problems; female foot problems. She is very knowledgeable about cute comfy shoes too! Dr. Amin has been practicing for over 19 years and the last 10 years in the Corona area. Our office is a full-service podiatric office including digital, low dose X-ray. Our staff is bilingual to serve the Hispanic community. Dr. Amin’s professional associations include The American Podiatric Medical Association, The California Podiatric Medical Association, and the American Association of Podiatric Medical Management. She has also been a lecturer at multiple venues, such as at Trilogy, Corona, as a speaker for Valeant Pharmaceuticals and various organizations within the Corona area. Spending time with her teenage son, husband and pup, Venus is Dr. Amin’s favorite, especially when she’s travelling the world with them (Venus has to stay home). She also enjoys fine wines and is a bit of a foodie. She enjoys cooking for her family and friends. Dr. Amin loves science fiction – Star Wars is her favorite movie and she also loves Star Trek TV shows.